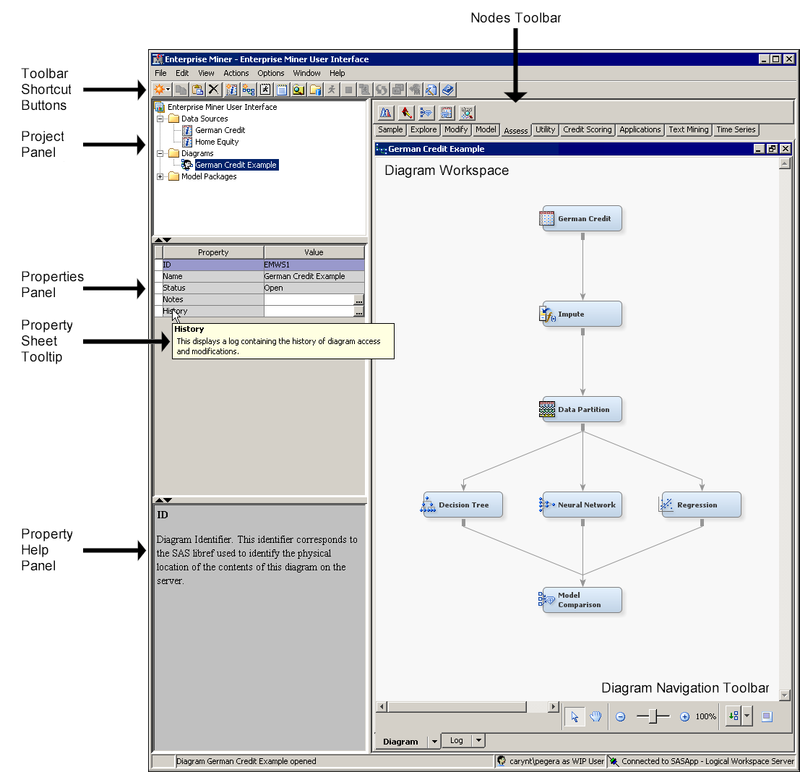 The SAS Enterprise Miner Toolbar is a graphic set of node icons and tools that you use to build process flow diagrams in the Diagram Workspace. The text name of any node or tool icon is displayed when you position your mouse pointer over the button. The SAS Enterprise Miner toolbar shortcut icons are a graphic set of user interface tools that you use to perform common computer functions and frequently used SAS Enterprise Miner operations. The text name of any tool icon is displayed when you position your mouse pointer over the icon. Use the Project Panel to manage and view data sources, diagrams, results, and project users. Use the Properties Panel to view and edit the settings of data sources, diagrams, nodes, results, and users. Use the Diagram Workspace to build, edit, run, and save process flow diagrams. In this workspace, you graphically build, order, and sequence the nodes that you use to mine your data and generate reports. The Help Panel displays a short description of the property that you select in the Properties Panel. Extended help can be found on the Help main menu.